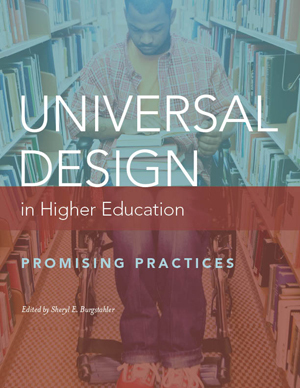 Universal Design in Higher Education: Promising Practices is an online book that continues to grow as further contributions are made. Practitioners and researchers who have applied UD in postsecondary settings are invited to submit articles presenting evidence of their successes. Article submissions are peer-reviewed by members of the Universal Design in Higher Education Community of Practice, which is managed by the DO-IT (Disabilities, Opportunities, Internetworking, and Technology) Center founded and directed by Sheryl Burgstahler at the University of Washington in Seattle. Accepted articles have been reviewed and edited. Universal Design in Higher Education: Promising Practices is available in HTML and PDF versions. For the HTML version, follow the Universal Design in Higher Education: Promising Practices book website. For the PDF version, go to Universal Design in Higher Education: Promising Practices - PDFs.